I have always found this picture incredibly intriguing and have had many opportunities to consider it since I have a copy on my living room wall at home. The colours of the floor and whitewash of the walls make it incredibly simple to locate within the decorations of a room with parquet floors. The incredible portrayal of light also benefit any space it adorns. 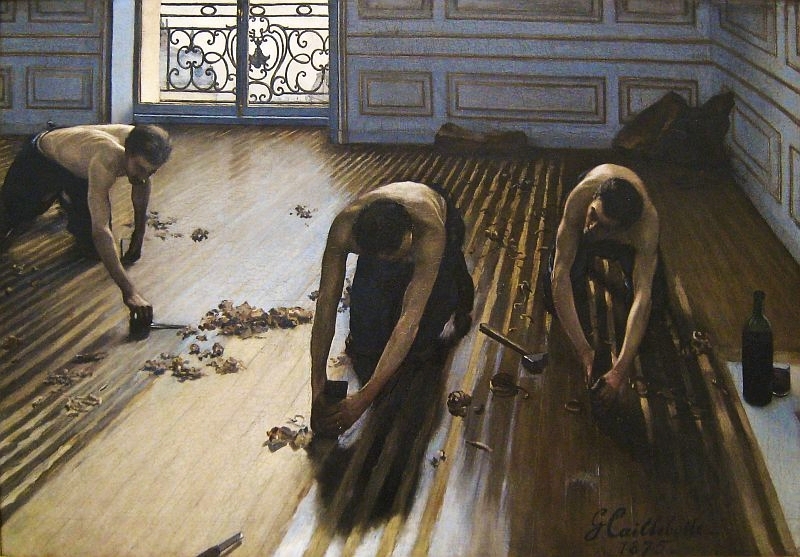 Caillebotte has expertly captured the light seeping through the window and its beautiful railings and has also portrayed the muscular labour of the workman as they wield their tools in the search for a better prepared and more aesthetically laid floor. I also wonder if there isn’t a hint of celebration in the artists portrayal of such physically impressive workers. Their poses hint at more than simply hard, manual labour. The artist’s perspective is looking down upon both their work and their bodies and it’s difficult to separate the two concepts. The play of light and dark; of the brightness of nature shedding light on previously unrealised shadows of its potency; the curled up shards of discarded wood clashing with the straight and parallel lines of the well-laid floor. There are many stories in the scene described here for us, let alone what the world outside from whence the light comes may offer us. There is innate beauty in the physicality proffered us as much as there may well be a wealth of social awareness and even confession as soon as we, at the invitation of the workers we see in the picture, scratch below the surface. 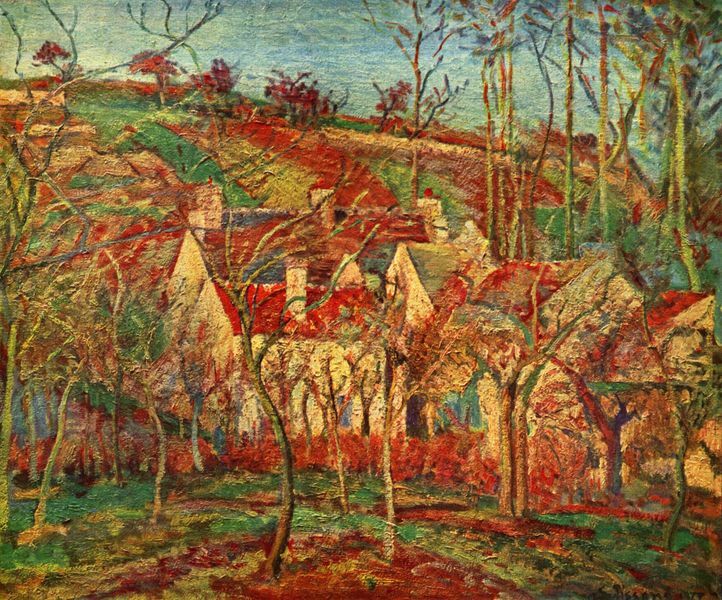 Pissarro has always been one of my favourite impressionists and this is one of my favourite works of his. For starters the colours are full of life the reds of the earth and greens of the grass speak much more of life than the barren browns of the trees, but the patchwork effect of the fields bending up the hill and the criss-crossing branches seems to ooze life from even the bleakest season of the year. The parallel patchwork of the rooftops hints at a harmony between man-made and nature-made whose logical manifestation are the ploughed fields – man and nature in creative union. The colours are vivid and vibrant but the overall effect is one of serenity, of a world at peace and in which we can appreciate the beauty of nature and the life of man together. The bushes that protect the house mirror in form the trees atop the hill, which frame (and protect) all we see below them. What would reward us were we to climb such a steep and curving hill? Another blissful scene of village and valley? And looking at the green going up the hill, are they the three prongs of the fork used to plough the field? Is the earth asking for man to give it back what it’s ceded in kind? I have looked hard and long for signs of people in the picture, but I’m pretty sure there’s no one there. And yet in the solidity of the buildings, buried staunchly in the centre of the picture by man and by the artist, there is a human presence with almost as much of an eternality to it as the seasonal landscape that surrounds and caresses it. Perhaps Camille was trying to warn us that our environment will only last as long as we do, or was he giving us the confidence to think we’ll last as long as the earth itself? A picture to come back to again and again, it soothes the eyes but energises at the same time. How I’d love to be able to wind my way between the trees and discover the village pub (for me the steep green roofed building, just in front of the mansion at the back of the village), slip inside and discover the artist having a well-deserved lunch break with the picture almost finished beside him. I love visiting galleries and enjoying works of art. I’m not even an amateur connoisseur of art however, I just look at whatever is put in front of me and have a think about it. Massacring Masterpieces is where I share those thoughts, hopefully giving you another angle on my Loving Life, and at worst adding some classy colour and impressive images to the blog. Would love to hear your thoughts on the masterpieces I choose as well as your thoughts on on my thoughts. Enjoy.